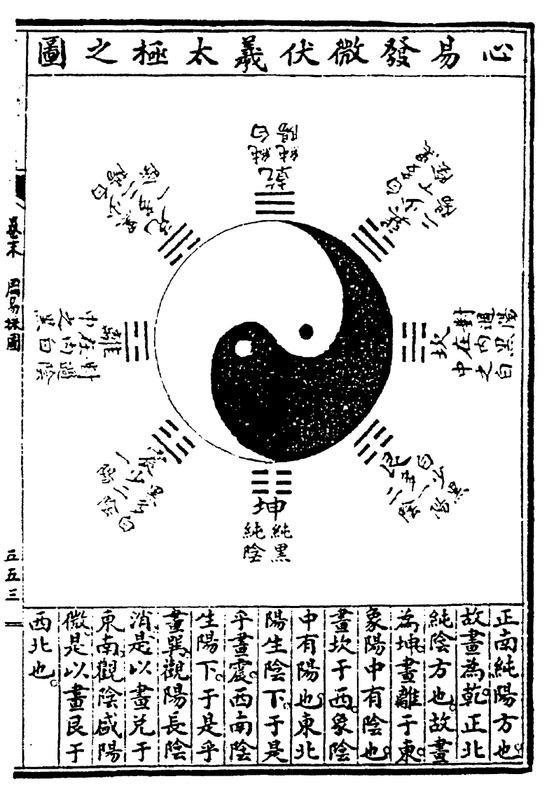 Few elements of Chinese culture have captured the minds of Westerners like the Diagram of the Supreme Ultimate (tài jí tú 太極圖), aka the yìn-yáng (蔭陽) symbol. Indeed, this symbol has become a pervasive image in our own culture: appearing on everything from surfboards, to t-shirts, to bumper stickers. Acupuncturists and practitioners of Chinese medicine are particularly fond of using it on their business cards, logos, and marketing materials. What does it mean? Where did it come from? The answers are not as straightforward as some believe. The term, tài jí, is mentioned in several ancient texts, including the Zhuāng Zǐ (庄子) and the Xì Cí Zhuàn (繫辞傳) commentary to the Yì Jīng (易经) (Robinet & Wissing, 1990). In both cases, tài jí is the state that follows Dào (道). The Hàn Shū suggests that the term “encompasses the Three in One” (Robinet & Wissing, p. 395). Looking at the black and white swirls of the tài jí tú, this definition makes sense—it encompasses yìn, yáng, and the transformations that result from their interaction. Other sources describe tài jí as: “the upper limit beyond which a process or concept can no longer be developed…the very Principle of the reversal of each thing into its opposite” (Robinet & Wissing, p. 398). Obviously, this is a complex term that—like qì—is difficult to render into English. I originally encountered Allen Tsai’s theory as a master’s level student of Chinese medicine. According to his theory, the tài jí was created by recording the shadows of the gnomon (sundial) throughout the 24 solar terms of the Chinese calendar. On the surface, Tsai’s theory seems quite plausible, because several ancient texts mention the gnomon in relation to astronomical observations (Major, 2010; Field, 1999; Ho, 1985). An early reference to the gnomon can be found in the Book of Odes: “Blessed was Chief Liu. He measured the breadth and length of the land; he measured the shadow and noted the hills, observing the sunshine and shade” (Field, p. 14). According to Stephen Field, a professor at Trinity University, “Liu was measuring the shadow of the gnomon, or sundial, to determine the cardinal directions” (Field, p. 14). In addition, the Huáng Dì Nèi Jīng 黄帝内经, the foundational classic of Chinese medicine, mentions the 24 solar terms in Sù Wèn Chapter 9. The Huái Nán Zǐ (淮南子), a text that was written during the Han dynasty, states: “When the gnomon shadow is long, yìn qì is dominant. When the gnomon shadow is short, yáng qì is dominant” (Major, p. 124). Looking at Tsai’s diagram, the meaning of this passage is clear: the gnomon shadow will gradually lengthen from the summer solstice to the winter solstice (during which time yìn qì dominates), and will gradually shorten from the winter solstice to the summer solstice (during which time yáng qì dominates). The astute observer will recognize that Tsai has modified his diagram: the shadow lines are drawn from the center of the circle toward the outside of the circle between the winter and the summer solstices, and drawn from the outside of the circle toward the center of the circle between the summer and the winter solstices. He made these modifications based on standard yìn-yáng theory, which suggests that yáng has an outwardly expanding motion, and yìn has an inwardly contracting motion (Tsai). On the surface, Tsai’s theory seems like a cogent explanation of the tài jí tú: it is based on a method of calculating the shadows of the gnomon that has been around since at least the Zhou dynasty (1046–256 BC). Why, then, did this diagram not appear anywhere in Chinese popular culture until roughly the Ming dynasty (1368–1644)? I imagine some of you are shocked by that last revelation—I know I was when I first encountered it! 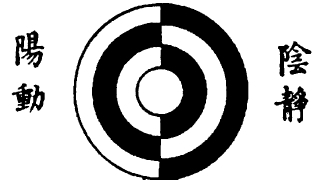 Let me reiterate: the earliest historical evidence of the tài jí symbol, in the form of the black and white swirl, does not occur until roughly the 14th century (Louis, 2003). Furthermore, the earliest examples of this diagram almost always include the Pre-Heaven (xiān tiān 先天) sequence of trigrams around the outside of the circle. The eight trigrams are visual representations of the natural phenomena that exist in the world (Cheng, 2008). Each of these trigrams is composed of yìn and/or yáng lines, the combination of which suggests the qì dynamic of the natural processes they represent. Allow me to shatter another common misconception: the Post-Heaven (hòu tiān 后天) sequence of trigrams, which is traditionally attributed to King Wen, is older than the Pre-Heaven sequence of trigrams that is traditionally attributed to Fu Xi (Louis, 2003). I mention this historical fact not only to rectify a commonly-held misconception, but because it bears direct relevance to the tài jí symbol. 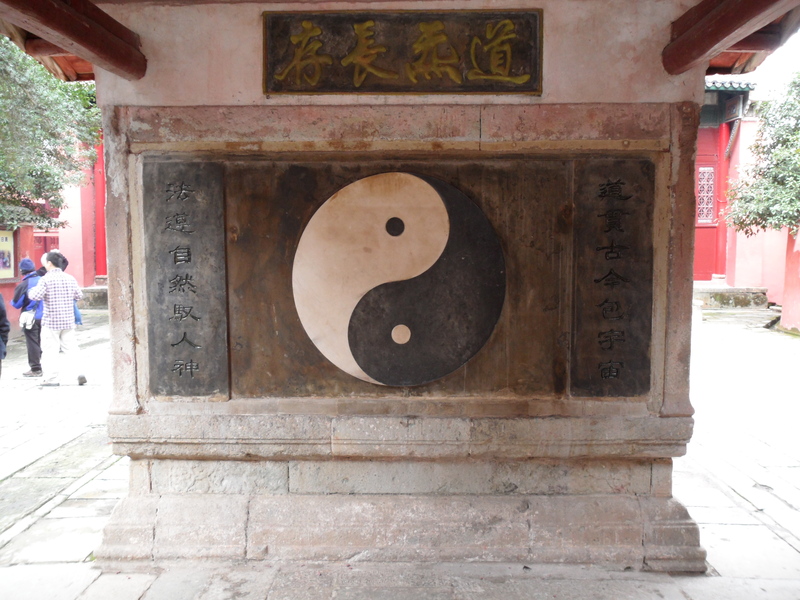 Examine the order of the Pre-Heaven sequence around the tài jí, and you will notice that the trigrams of the four cardinal directions are directly related to the black-and-white swirl. At the top, where the diagram is most yáng, we find the trigram for Heaven (qián 乾). At the bottom, where the diagram is most yìn, we find the trigram for Earth (kūn 坤). To the left, where the diagram is equal parts yìn and yáng, we find the trigram for Fire (lí 离). Finally, to the right, where the diagram is also equal parts yìn and yáng, we find the trigram for Water (kǎn 坎). According to Zhu Xi, a Song dynasty scholar: “The position of qián and kūn is at the top and at the bottom, while kǎn and lí descend between them…this image has the form of a city wall and its rising and descending sides are like the revolving wheels on the naves of a chariot axle—one at the bottom and one at the top” (Louis, p. 165 n. 50). What does all this mean? It means that the tài jí tú is closely related to the newer Pre-Heaven sequence of trigrams—of which there is no historical record until the 10th century, at the earliest (Louis, 2003). In fact, historical records indicate that the Pre-Heaven trigram sequence predates the tài jí tú (Louis, 2003). It also suggests that Tsai’s analysis of the origin of the diagram may be correct, but misleading: the diagram may have come about much later than the knowledge of the gnomon. Still, the trigram associations at the cardinal directions match perfectly with Tsai’s hypothesis. At the top—or South—we have the most yáng trigram (qián 乾), corresponding to the summer solstice. At the bottom—or North—we have the most yìn trigram (kūn 坤), corresponding to the winter solstice. To the left—or East—we have the trigram with one yìn line surrounded by two yáng lines (lí 离), corresponding to the vernal equinox. Finally, to the right—or West—we have a trigram with one yáng line surrounded by two yìn lines (kǎn 坎), corresponding to the autumnal equinox. As stated in the Huái Nán Zǐ (Chapter 3): “The unified essences of Heaven and Earth are yìn and yáng. The concentrated essences of yìn and yáng are the four seasons” (Schulz & Cunningham, p. 290). The tài jí tú and xiān tiān trigram sequence are a wonderful visual example of this much older statement from the Huái Nán Zǐ, but there is no historical evidence to suggest that they were known during the Han dynasty when the text was written. Similarly, though Tsai’s analysis seems to match well with this later diagram, we should resist the conclusion that the diagram is as old as the gnomon. Perhaps some of you are familiar with the other version of the tài jí symbol, as illustrated by Zhou Dunyi. This version of the symbol, while historically older than the more popular tài jí tú described above, still utilizes the Fire and Water trigram positions of the Pre-Heaven sequence. On the left is the trigram for Fire, and on the right is the trigram for Water. The characters to the left and right of the symbol say: “yáng, motion” and “yìn, repose” (Louis, 2003). The center of the circle represents wú jí (無極), a balanced and undifferentiated state of yìn-yáng (Wikipedia), loosely translated as “there is no extreme” (Schuessler, 2007), or “no ridgepole” (Robinet & Wissing, 1990). 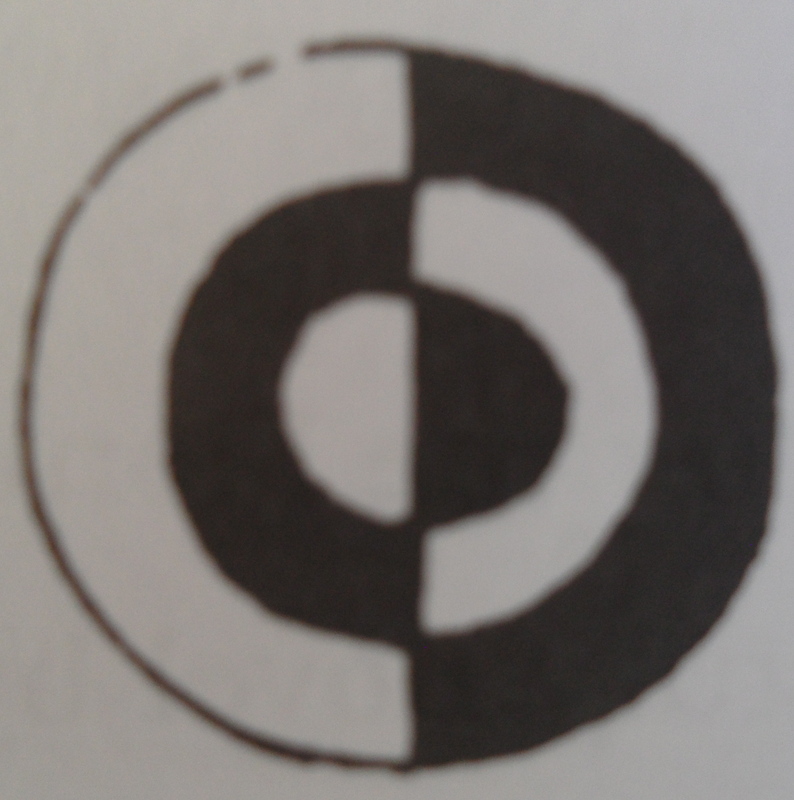 While this particular diagram is attributed to Zhou Dunyi, there is an older symbol that is quite similar. This older symbol is attributed to the Buddhist scholar, Zong Mi, of the Tang dynasty, who used the symbol to denote a balanced consciousness in which “the true and the false” are blended (Louis, p. 177). Although Zong Mi was Buddhist, some scholars have suggested that the diagram itself may not be purely Buddhist in origin, due to the fact that the original colors were red and black (Robinet & Wissing, 1990). Red and black are the traditional Chinese colors for Fire and Water, respectively, suggesting cultural influences beyond Buddhism. Furthermore, since this diagram was a product of the Tang dynasty, the Daoist ideas of nèi dān (内丹) or inner alchemy, were already established (Robinet & Wissing, 1990). Obviously, despite the work of scholars to decipher the origins of the tài jí tú, the history and inception of this iconic symbol are still somewhat of a mystery. While it is still entirely possible that this symbol originated in the gnomon measurements of the ancients and was passed down secretly for centuries, there is no historical evidence to support such a claim. Based on all available evidence, the symbol has its origins during the Tang dynasty, at the earliest. Perhaps the mysterious nature of the “Diagram of the Supreme Ultimate” is only fitting for a symbol that expresses the inexpressible. We could engage in endless amounts of speculation, though the answer may never become any clearer. I will leave you with an even more puzzling thought: how did this symbol find its way onto the shields of 4th Century Roman soldiers—before it was ever recorded in China (Monastra, 2000)? Chung-ying Cheng (2008). “The Yijing as Creative Inception of Chinese Philosophy”. Journal of Chinese Philosophy, vol. 35(2). Stephen Field (1999). “The Numerology of Nine Star Fengshui”. Journal of Chinese Religions, vol. 27. Peng-Yoke Ho (1985). Li, Qi, and Shu. Francois Louis (2003), “The Genesis of an Icon: The Taiji Diagram’s Early History”. Harvard Journal of Asiatic Studies, vol. 63(1). John Major (2010). The Huainanzi. Giovanni Monastra (2000). “The Yin-Yang Amongst the Insignia of the Roman Empire?”. Sophia, vol. 6(2). Translated by John Monastra. Isabelle Robinet & Paula Wissing (1990). “The Place and Meaning of the Notion of Taiji in Taoist Sources Prior to the Ming Dynasty”. History of Religions, vol. 29(4). Larry Schulz and Thomas Cunningham (1990). “The Seasonal Structure Underlying the Arrangement of Hexagrams in the Yijing”. Journal of Chinese Philosophy, vol. 17.